March 2012: Just "Voted # 1 Boutique Spa in Wisconsin" by Milwaukee Magazine! "While in Door County find yourself at the Lavender Spa in Fish Creek. We specialize in massage therapy, all-natural products and holistic body care in a serene, intimate environment. Each intuitive massage is designed specifically for you including a consultation of your needs with a massage therapist. 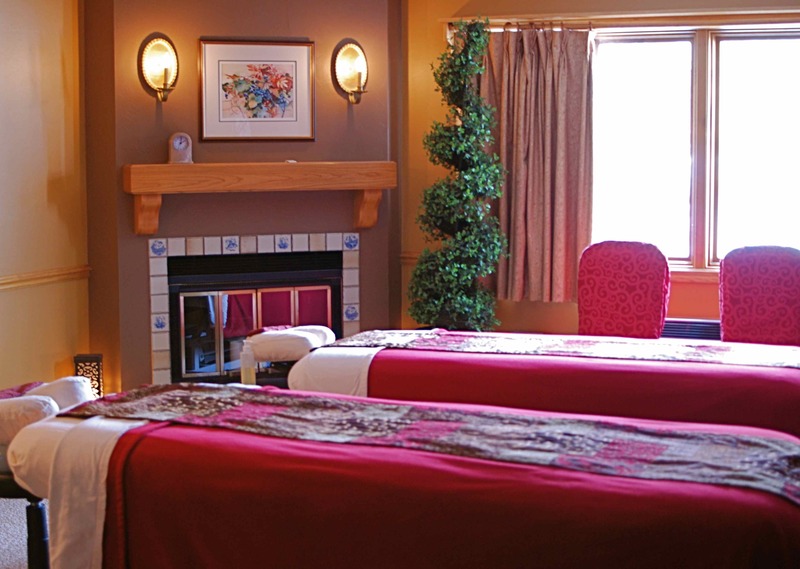 Try our dedicated couples massage room, our infrared cedar sauna and spa and lodging packages. Open all year by appointment. Gift Certificates available. 'Live well, laugh easily, and feed your soul!' "
This spa comes with lots of experience. The owner, Marise Redmond, has been running the spa and inn for years. The therapists also have many, many years of experience at their craft and are dedicated to the healing arts. The atmosphere itself is therapeutic. Marise has done an outstanding job in designing the spa for maximum effectiveness. Soft colors, coordinated, flowing, textured fabrics and soft lighting create an environment that is tranquil, peaceful and is itself the rapeutic. Get away from the hustle and bustle of everyday life, and enter this sanctuary for some respite and rejuvenation! Even the artwork supports the them of calmness, and the walls of the treatment rooms add to your comfort. The spa offers virtually everything, and more. From soothing and restoritive massages like The Ultimate Massage, to deep tissue massage, you can choose from an extensive menu of available services. Shoulder massage, 30 minute "teaser" massage, face massage, aromatherapy, foot massage, hot stone massage and more. They even have massages for "couples" too! The Lavender Spa~Fish Creek also offers an infrared cedar sauna, which cleanses the skin, relaxes the muscles, while the heat goes easily into the body (unlike the hot stone/steam saunas), and is easy to tolerate. This is ideal, Marise says, before a massage. When I first spoke with Marise a few years ago about back problems I have had from auto accidents, she told me about a process called myo facial release (MFR). The fascia in our bodies is a webbing that covers all our muscles, nerves and more. The process frees up motion and relieves pain. So I tried it with a local MFR expert, and it really helped my back. This person is now at the Lavender Spa~Fish Creek at the Settlement Courtyard Inn! There are not many people around who have this expertise, so this is something you might keep in mind if you have chronic pain. It really worked well for me! Whatever treatment you decide upon, it will be custom-fit for you. Each massage is customized for you, as you discuss your needs and specific problem areas before you begin, with your massage therapist. Awesome. They even offer couples massages (see photo below of couples room). This spa caters to both out-of-towners and locals alike. In fact, residents of Door County can make this spa a regular stop, and get 10% off on "community appreciation days." I booked a deep tissue massage. I spoke with the massage therapist prior to beginning, and asked that she focus specifically on my back, where I have had the most problems in the past. The treatment rooms are relaxing. The colors are rich and soft at the same time, and soothing music is softly playing. For an hour, she found every nook and cranny in my back and hamstrings that needed attention, and worked those muscles deep and with expertise. Then she suggested that back muscles actually continue around to the stomach area, and worked those muscles as well. Who knew? She did, and when my hour was up, I felt terrific! I would highly recommend deep tissue if you have specific areas that need attention, and the Lavender Spa~Fish Creek is a great place to go for it! For lodging plus spa packages, you can check their main website for the Settlement Courtyard Inn. I was impressed! I spoke with Marise afterwards, and told her she has a wonderful spa that I am certain will help and rejunevenate many , many people in the weeks and years to come. We then toured the facility, looked at the infrared sauna, and common areas. All spectacular. The Lavender Spa~Fish Creek uses only chemical-free, unscented oils and lotions. They are all natural, pure essential oils. The retail section of the Spa offers all natural products for sale tha tyou can purchase and take with you. Bindi(tm) makes all natural oils, mist facial cleansers and masks, balancing oils and more. All natural lavender soaps, vegertable washes, yoga mat washes, and Door County soaps are all offered. There are aroma-therapy candles, botanical items, baby massage oils and more. This is a first-class spa, and a great convenience for those staying at the Settlement Courtyard Inn, and a great find for all who would like to treat themselves to a wonderful spa experience. And please tell them that DoorCountyNavigator.com sent you on this tranquil journey!